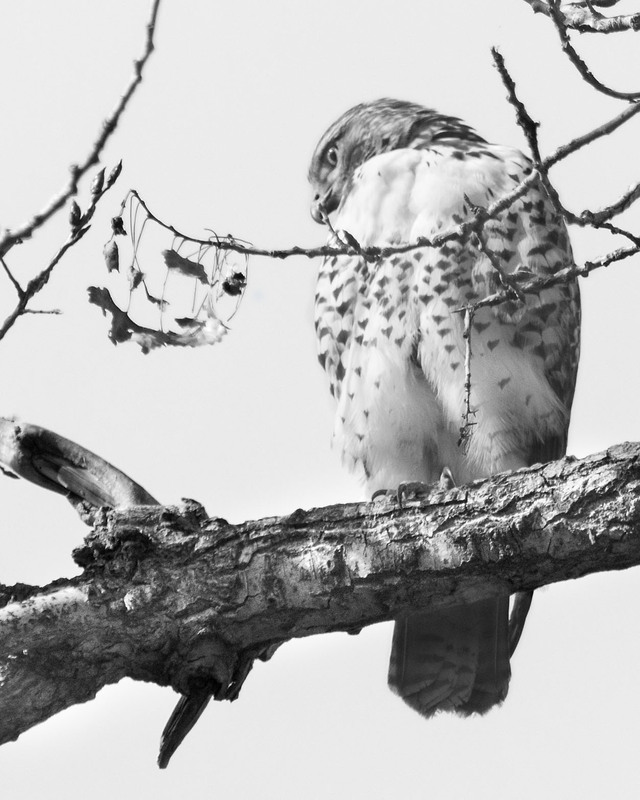 We watched this Coopers Hawk move move about from tree to tree ever vigilant for and aware of their potential next meal. 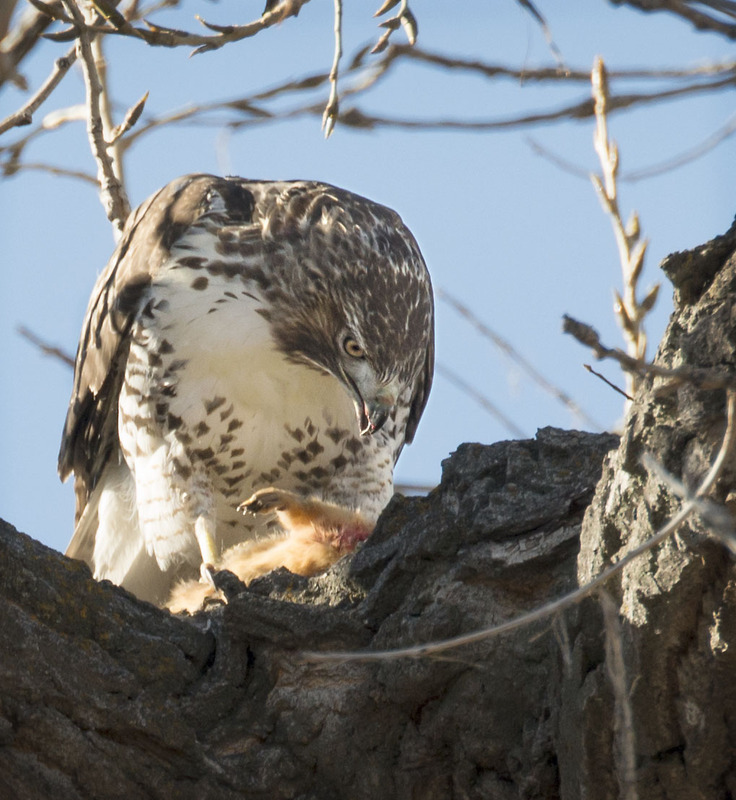 Although we did not see the chase we saw the result as squirrel was on this Hawks menu. How do you all like the new WP reader format? Yum. Squirrel for lunch. We were watching out the back window as the birds and a squirrel rummaged about. Like a streak of lightning, a Cooper darted in from the left and grabbed the squirrel. It sat a few moments and got a good grip with clawed feet. Then, it leaped upward and flew off with the squirrel tail flicking below. So impressive. HI jim, nice story. A squirrel for a coopers is a good haul. We need more in are area as the squirrel population is exploding with all the development and loos of predators. Hope you are having a great weekend. Thanks, we appreciate the feedback. Hope you are having a wonderful weekend. What a majestic and proud bird! Thanks for posting. Thanks Marcus, hope you are having a great weekend. lovely photos of the hawk, especially liked the intent stare in the last one.. re the Reader, I do not like that the initial photos are so small, that could put people off of visiting the post and that is rather sad. HI Vicki, as a person posting mainly photography I agree that the small photos really don’t draw in someone to look at a post. It may work for post featuring writing but does not do justice to photography based posts. Wonderful photos! And don’t think much of the new reader. Thanks, ti does pose a problem to have your photo randomly sliced and displayed in a way in which does it little justice. Hope your weekend is gong well and I hope you do get that weekend snow. Cheers. Thanks Belinda, The new reader is problematic for photographers it seems. 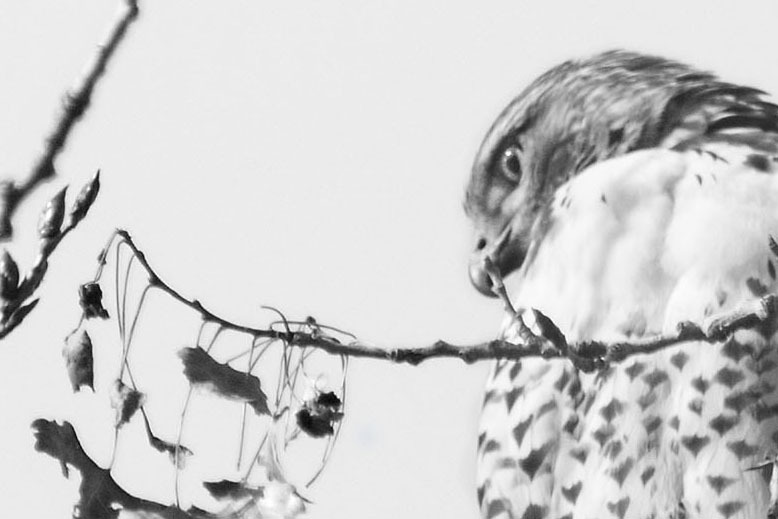 This current post for example presents only the bottom 1/3 of a hawk. Such a presentation doesn’t really seem to draw in readers at all. Did you change the formatting (size) of your photos to make them show better in the new reader? No, just a lucky crop I guess. Not an acceptable situation. I agree having just the middle of photo show up for a photography blog is not an acceptable way to showcase your work. The hawks are great, the reader does a disservice to photographers. How do we get our point across? Thanks Victor, glad you took the time to look at the photos. The new reader format only presented the bottom 1/3 of a hawk. Not exactly a view to draw someone into looking at the work. I guess we need to suggest changes to wordpress in some way. Many people complaining. We need a way to make our point. Have you seen the discussion in the support forums? Victor I have but it appears that topic has been closed to new comments. The new Reader has some severe consequences for photographers and other artists who have worked hard and are showcasing their work. The cropped format (portrait or landscape) is one problem; a second is miniscule thumbnails (try to see the detail in a landscape, or street scene at such a size or even distinguish between them). Magazines on line and in print have understood this for a long time, but magazines also get to choose their content, art and photography. The Reader is a forum for people to advertise their work quite the reverse from a magazine. Be it prose, poetry, painting, photography or news people choose what to post, its format and content, they work hard at that and Reader discards all of it when it comes to photography. Moving on to other improvements, as a photographer I might not like the “gallery format” maybe it does not suit my story line – does it even show my photos in order? And why would anyone want to visit my blog or view my post when most of it is there in Reader for him or her to see? How and why is it that Reader choses from my posts what to advertise at the bottom of my post, what if I am doing a series of posts and the posts chosen by the algorithm have nothing to do with that series. Why not have different formats for “Tag pages” where art/photography is the subject? We all work hard on our content and to have these changes imposed on us hurts. Many of us like WordPress for the community. Reader is a key function in that and having someone decide for us how our work and efforts will be reformatted does not help the community. Victor thanks for the link to the comments page for the new reader. I have also posted there. Have a great weekend. I agree with everyone. Awesome photos. Great shot with the squirrel. Ditch the new format. While I like the clean look, it doesn’t show off your beautiful photos. Thanks, I don’t care for the format either. HI and thanks, yes this coopers hawk was doing their part in controlling our runaway squirrel population. We just need many more and perhaps a few owls. I agree that the new format does not show the photos as well and as a photographer that concerns me. Hope you have a great weekend. I don’t see a difference. I am mostly on my tablet, so not sure how different that is from a future device. Hi Sarah, I will have to browse on my tablet to see who that looks. Thanks for the heads up and for the feedback on the photos. We appreciate it. Have a great weekend. Love the clarity of these photos! Not crazy about the new format. Thanks Camie, seems many are not thrilled with the new format. Great shot! I spotted one on the tree next to our house – it was a juvenile with that lovely creamy chest. Hi, they are wonderful looking birds and each one just a bit different. This guy/gal had a very fluffy chest. Hawks are so beautiful. Thanks for just including the little squirrel arm as opposed to the full visual. I’m okay with the reader. I just hit visit site, which takes me where I want. Otherwise there are a million clicks, which I don’t have patience for. Your Coopers looks nothing like our Coopers. Wonderful crisp captures. I was just thinking that the new WP Reader is pretty cool! It splays out multiple photos on the desktop, but things still look the same on the smartphone. No prob. I’d come check out your posts no matter, Mike. Cheers! Hi Shannon. thanks for the feedback and for checking out the full posts. I just wonder how draw you might be to a new blog if the photo only displays a slice of the full photograph? Have a great weekend. Hey, Mike, did you notice that there is now a ‘zoom’ feature for one-photo posts? That is, if you roll the mouse over the center-cropped image, it will display the full size? Just noticed it today. Cheers! We sometimes get a Coopers at our feeders, chasing the other birds away. But in a flash, it might also be one of the Peregrines that live down by the mills. A thrilling moment, either way. Hi Jnana, thanks for the feedback as we really appreciate it. We also sometime see coopers at our feeders waiting and sometimes getting a meal. Usually a pigeon. We can always tell when they are present as sometimes the action at the feeder abruptly stops and no birds are to be seen. Hope you are having a great weekend and thanks again for the feedback. Beautiful photos. 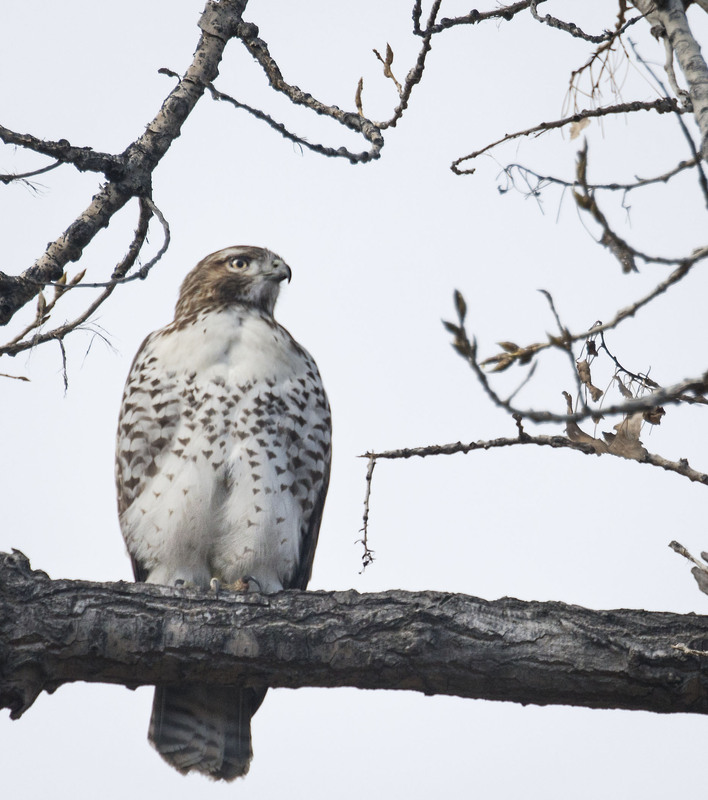 I love to see hawks, but there is so much housing construction and the consequential infrastructure where I live, they are losing habitat, so I see fewer and fewer hawks. I open all posts and have no problem with the Reader, although I sympathize with bloggers who are unhappy with the way their photos and art are affected. Hi Robin and thanks for the feedback. The number of birds of prey where we live is on the decline due to development as well. This has left us with a squirrel population that is beyond big. Glad this guy was doing his part to reduce it a bit. Thanks for opening the posts and your feedback. My beef that someone unfamiliar with a blogs content seeing only a slice of an image would not likely be attracted to and then open a post. Have a wonderful weekend. Gorgeous chest feathers on this hawk. The new Reader seems slow to me. Rarely do I venture into the other offerings, but I think I see that others click through on the places my random posts turn up. It might increase traffic, who knows? We always know when one is presenting our yard by a sudden absence of birds at the feeder in winter.